Jump on in! The water's fine! Before I move on to the second thing I learned the hard way, I wanted to throw in a sub-lesson that goes with the last post dealing with the germy mess that is "fish poo water." 2. Do your research BEFORE you go to the local fish store (LFS). This is so important, I just can't stress it enough. Impulse buying in the aquarium hobby is almost always a disaster waiting to happen. Whether you're purchasing livestock, plants, tanks or filters, it's always best to know exactly what you're shopping for before parking your car and stick to that list (and that list only) while you're shopping. A good strategy for me when I'm just browsing at the LFS is to leave my wallet in the car. Pre-shopping with a notebook and pen is a good idea - be sure to write down as much information as possible so you can compare it to what you find elsewhere. Most LFS don't list scientific names for their livestock, but if they do - THAT'S the name you want to work with. Take your list home and do a few internet searches. I guarantee the first time you do this, you'll be amazed at the discrepancies from source to source. 1. Compare the internet pictures with what you remember seeing at the store. *Is this the same fish? 2. Compare prices, if available. 3. What is the fish's temperament? *Are they peaceful little Ghandi-fish or are they Rambo-fish that will rip into anything that crosses their path? *Do they have any particular habits that might make them incompatible with other tankmates? For instance, many barbs have a reputation for being fin-nippers. Not a good idea to put them in with a slow swimming fish with long, flowing fins - like a betta. That's like waving a red cape in front of a raging bull. Trust me, I know these things! 4. What does the fish eat? Is it a carnivore or an herbivore? Whenever possible you want to house fish together that have same basic diet. 5. Along the lines of #4, What will the fish's ultimate size be? *How is this related to fish diet, you ask? 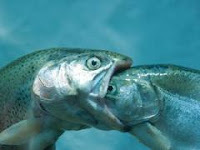 Well, here's the general rule of thumb with fish keeping: If a fish CAN fit into another's mouth, it WILL. So yeah, size matters. *Remember that most fish you see in the store are either babies or juveniles. *Another consideration is whether or not you can responsibly house a fish of that size. Be sure to consider not only the bioload that fish will create for the volume of water but also the amount of swimming room the tank will provide. This sort of goes back to temperament. Some fish are like husbands - basically sedentary until mealtimes. Others are like toddlers on speed - never stop zipping around and driving everyone else around them crazy. *This is one area where you're likely to NEVER get accurate information from the store. Do your own research, check several sites, and split the difference. When in doubt, ask someone who's kept this fish - there are lots of forums out there with people willing to help, like Fishgeeks. 6. Here's a new one to make the list - What is its track record for breeding in captivity? And also, how sure can I be that I have males (or females). LOL Just guess how THAT one came be on the list! *If your goal is to breed your fish, you want to be reasonably sure you have at least one male and one female (duh, huh?) and that you have the appropriate set up for breeding and raising the fry. Think, honeymoon suite and nursery. Don't forget the baby food. *If you don't want them to breed, try just getting one male. Not just one female - some species (like guppies and platies) can carry fertilized eggs from the store's tank and drop them after you bring them home - sometimes weeks later. And not more than one, even if you think they're both male... TRUST ME! Don't believe me? Check out the photobucket slideshow on the right... there's a pic of some of the babies being raised in a tank that supposedly only housed males. HA! I'm not going to give you the run-down for each and every incident that has led to the making of this list. Let me just say that I started out with a single 10G tank, not so long ago. At one point I had 15 tanks up and running, of various sizes. I've since stabilized at about 7 (soon to be 6, I think). THAT'S the power of researching before buying. Until next time................................ Just keep swimming! Got a lesson you learned the hard way to share? Just want to comment on my stupidity? Post a comment and let us know! Most of us know to wash our hands before we eat and after we use the bathroom (at least I hope so). Some of us know to wash our hands before we stick them in our fish tanks to keep the oils and chemicals out the tank. But do we all wash our hands when we're all done? Yeah? How about between tanks? Why is this important? I rock, right? Yeah well... just wait. So I finish that water change get ready to do the next tank. I'm not actually doing the water change yet, so I guess my brain took a little break. Cuz here's the important fact I've neglected to mention so far. That yummy candy my son was sharing? Umm, yeah... they were JuJee Fruits. You know, the candy with super-glue as it's primary ingredient? Hmmm, yep - that one. So what does super-fishie-mommy do? Sticks her finger in her mouth to dig the candy out of her teeth. Oh yeah - I did. (gack!) Suddenly a flavor other than the candy flavor fills my mouth. Anyone who has ever had a mouthful of mid-summer pond water knows what I'm talking about. Moral of the story? One thing I learned the hard way - I can't trust my brain to save me, so always error on the side of caution. Wash hands before, during and after work on tanks. Wash, wash often and when in doubt - wash again. Swim on by later in the week for another "Things I Learned the Hard Way" (aka Stupid Things I've Done). Got a thing you learned the hard way to share? Just want to comment on my stupidity? Post a comment and let us know! Ok, I've been following the controversy on the blogs all day and I just can't keep my mouth shut (or my fingers still) any longer. This man (questionable term) is an idiot, a moron, and a screaming fool! Ironic that those are the words he uses to describe children with autism. Now, I don't personally listen to this guy because I find him offensive in so many ways, but boy ~ have I hear about this broadcast. Even for someone who has made a reputation for himself as "shock jock" and even a hate-monger, this jerk has gone WAAAAY to far this time. You just don't mess with defenseless children, in my book. "I'll tell you what autism is. In 99 percent of the cases, it's a brat who hasn't been told to cut the act out. That's what autism is. What do you mean they scream and they're silent? They don't have a father around to tell them, 'Don't act like a moron. You'll get nowhere in life. Stop acting like a putz. Straighten up. Act like a man. Don't sit there crying and screaming, idiot.' " Savage concluded, "[I]f I behaved like a fool, my father called me a fool. And he said to me, 'Don't behave like a fool.' The worst thing he said -- 'Don't behave like a fool. Don't be anybody's dummy. Don't sound like an idiot. Don't act like a girl. Don't cry.' That's what I was raised with. That's what you should raise your children with. Stop with the sensitivity training. You're turning your son into a girl, and you're turning your nation into a nation of losers and beaten men. That's why we have the politicians we have." Say what? 99% of autism cases are nothing more than brats who would be cured if we just verbally abused them? Gee, I wish someone had told me that sooner ~ I could've saved myself all the time, energy and money I've poured into my son having the best shot he can have at a happy life. There are just not enough words in the English language to describe what I'm feeling right now. Outraged, definitely. And probably a little heart-broken that there are people in this world who are so hateful to children who are struggling and doing the best they can to fit in and be happy. And how DARE he imply that it's our fault, as parents, that our children suffer from this disorder. Those comments were cruel and hateful... there's no other way to describe it, IMO. What really worries me is that I know that there are so many parents out there that struggle with the feelings that they are to blame and deal with insensitive people passing judgment on them when they try to take their children out in public and give them a 'normal life.' What if these parents, in their desperation, latch onto that idea? I know that, early on, I did deal with these feelings. I even had family members pressuring me to "just spank him when he does that... he'll stop." (insert obsurd fake laugh) Or, "There's nothing wrong with him! You just coddle him and make him into nothing but a sissy boy." (said right in front my son) And I'm ashamed to admit that I was so over-whelmed and exhausted and heart-sick at that point, that I couldn't think straight. Those types of comments had me second-guessing myself and what I thought I knew about my son. As long as jerks like Savage can not only get away with saying things like this, but also get paid to say them, we will never live in a just and compassionate world. His hateful comments give others the excuse to continue to think this way. I know that many other bloggers and autism activist groups are doing this, so I'll lend my small little voice to the cause ~ we need to shut this guy down!! I would like to call on everyone to not only boycott his show, but also boycott his sponsors. Memoirs of a Chaotic Mommy has the most up-date list I've been able to find of the sponsors of his show. Please check it out and speak out against this type of ignorant hatred with the only language these goons will understand ~ your dollars. Let us know what your thoughts on this matter are by commenting. Let us know! All right everyone! Check THIS out! I found out about this article from a fellow Fishgeek and just HAD to share it. I'm going to withhold my opinion at this point because I want to know what YOU think. Would you do this or not? Do you think it will catch on here in the US, like it apparently has in Asia? Let us know. Today's Fickle Fishbowl column will be dealing with duckweed. Whether you call it by its scientific name (Lemnaceae minor), or by some of its more common names (duckweed, water lentils), or "You stupid piece of crap! Get the heck outta my tank and stop sticking to my fingers!" most aquarist who keep live plants have had some dealings with it. Why? Because, much like unwanted snails, duckweed is another hitchhiker that that we have to contend with. Awhh, it looks so cute and harmless, doesn't it? Don't be fooled! This stuff multiplies rapidly (even when it appears to be dead) and sticks to everything! Once you get a little piece of duckweed in your tank, it's a neverending battle to get rid of it. Worse, since it's a sticky little hitchhiker, you may be inadvertently transferring it to other tanks as well. Ew! Not so pretty now, is it? See it sticking to the bare glass? That stuff will dry out and look dead, only to be accidentally knocked off into the tank and WHAM! Duckweed soup all over again. Think I'm exaggerating this time? Some people have reported that duckweed can cover 2x its previous surface area in as little as 3 to 4 days! That's right ~ I said DAYS! 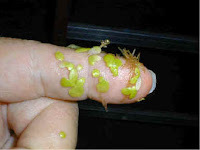 Consider that most people who are victims of duckweed hitchhikers are planted tank keepers. Duckweed creates yet another problem. Since it is a surface-dwelling plant, a thick mat of duckweed will quickly block all light to the rest of our plants ~ effectively making those expensive plant-friendly lighting upgrades useless. Can you say, "GRRRRR!"? But it's a plant ~ good for the tank, right? Not necessarily. While it does help with water quality ~ absorbing ammonia and nitrate from the water~ it's not the best for maintaining a proper level of oxygen and carbon dioxide in the tank. Why? Well, I'll tell you. 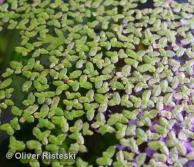 First, since this is a surface plant, most of the oxygen released by duckweed is released into the air. That's right ~ THE AIR! How is that beneficial to your fish? Second, if left unchecked, duckweed can quickly cover the entire surface of your tank. This limits the water's natural ability to outgas carbon dioxide. Is that important? You bet it is. Contrary to what most people believe, it is not the lack of oxygen that kills fish, but the concentration of carbon dioxide. If we don't have a large enough surface-to-air area in our tanks, we can kill our fish. Water circulation equipment (airstones for example) are beneficial NOT because they add oxygen to the water, but because they aggitate the surface of the water ~ allowing carbon dioxide to escape the water column. Hmmm, not looking good for duckweed. In the right situations, duckweed CAN be an asset to a fishkeeper. It really depends on what you need in your aquariums. If you keep fish that require super-high veggie content in their food, duckweed can help to balance out their diet ~ if they'll eat it. Duckweed has been reported to have laxative properties, so fish known for swim bladder disease or certain types of bloat could benefit from duckweed in their diet. Goldfish and koi are known to love this stuff! A few of my cichlids will nibble on it a bit, but because of the risk of clogging my filter (a HUGE no-no when keeping messy fish) I only add a few pieces at a time and watch to be sure it's eaten. Use with caution! The preferred method of including duckweed in your fish's diet is to keep the plant in a separate tank, harvest and freeze it, and either mix it into your homemade fish food or feed it in small quanities as you would any other frozen food. Another possible benefit of duckweed is that it provides cover for fry and shades the tank to help some fish feel more secure. It also provides a place for infusoria to thrive ~ first foods for many small fry. So, duckweed can be food and shelter for certain fish, but is duckweed the best plant to provide this? That's a question that every aquarist has to answer for themselves ~ it depends. ;) Many plants can provide cover, if grown properly. Any fine-leaved plant (many mosses, such as java moss) can provide a place for infusoria to shelter. And many high-quality commercial and homemade foods do not contain duckweed. That said, duckweed is a plant we can definitely do without! Well? What's your take on duckweed? Have a story to share? Let us know! Oh, I'm a sucker for freebies! If you're a subscriber to Freshwater and Marine Aquarium magazine, you may have already seen the freebie in the September 2008 issue that just came out. If you're not a subscriber or maybe just skimmed right by the ad... Fear not, fellow fish lovers! Nikabee's lookin' out for ya'! Here's the scoop: New Life Spectrum is offering a free sample of their All Purpose Formula. Now, I've only used the Cichlid Formula myself, so I can't speak for the All Purpose Formula. I can say that I (and my fishies) ADORE the Cichlid Formula. It smells a bit funky, but in my experience ~ all good fish food does. That's because the primary ingredients in good fish food are... that's right, folks! Fish (or some other type of aquatic life). Even fish lovers like me have to admit that fish are stinky ~ especially when they're no longer living. Word of warning for those that are concerned: the Cichlid Formula does contain Ethoxyquin as a preservative. Personally, I haven't had any problems feeding my fish foods that contain this, so I guess it's a personal preference-thing. I will say that although many are against the feeding of foods containing Ethoxyquin, I haven't found any concrete scientific study on its effects. The website does not list Ethoxyquin as an ingredient in their other foods, but if you are one of those people who are concerned about its use, you might want to double check the label when it arrives. But, even if you are and even if it does ~ what have you lost? A whopping 3 mins of your time. I say go for it... it's FREE! Have any other freebies to share or want to discuss your favorite fish food (err... your fish's favorite food)? Let us know! Oh! I've found the perfect site for an eclectic web surfer like me! I was bopping around the net last night when I stumbled upon ~ Stumbleupon.com! Sign up is free (always a plus, in my book) and it enables you to peruse various web sites, based on your interests. Anyone interested in signing up for this can go here to sign up and start Stumbling! Now, I'll be honest ~ I wasn't all that excited about it when I first heard about it, but I thought... "What the heck? It's free!" (I'm always a sucker for free stuff). So, I gave it a shot and I'm not kidding ~ I was up until after 3am last night Stumbling around the web. I've been a random surfer for many, many years but I know that, on my own, I would never have found some of the sites I visited last night without Stumbleupon. 1. How to get rid of things: Holy moley... This site covers it all! Everything from acne to bugs to ghosts! You can tell that the people behind this site have either a vast amount of professional knowledge, or they've done a crap-load of research. They even cover some aquarium-related how-to's. (double plus!) One thing that I found personally significant is that they offer many natural remedies, in addition to commerical products. Even if your life is perfect as it is (ha! doubtful, right?) and you have no need to rid yourself of anything, this still makes for a remarkably interesting read. 2. You Grow Girl: Anyone interested in gardening or just having a nice yard will find something of benefit on this site. The writers and the community at this site have a strong emphasis on eco-friendly gardening and bucket loads of unique ideas and tips. And so concludes the first installment of Cool Reads (mostly because I need to get to bed early tonight! lol). Until next time... keep on Stumbling! Wanna share any cool sites you've stumbled across recently? Or comment on those I've listed? Let us know! Welcome to Swimming with Fishies! Here's where I'll share some of my experiences in fishkeeping ~ with a few personal tidbits thrown in from time to time. If you're not interested in aquarium fish or related to me in some way, you'll likely be bored to tears by this blog. Sorry. But if either of the previous descriptions applies to you ~ Jump on in! The water's fine! Be sure to check out some of my links and feel free to share them with others if they've caught your interest. There are also a couple of regular features that will be updated regularly. One is The Fickle Fishbowl, where I'll run down some my issues and pet peeves in fishkeeping and generally just vent! The other is Things I Learned the Hard Way, where I'll share how stupid I can be sometimes and you can walk away feeling pretty good about how smart YOU are! Feel free to comment with your own experiences or questions if the mood strikes ya! Pogo - the reason my blog and my fish suffer on Wednesday mornings! Preuss Pets - located in Lansing, Mi ~ worth the drive!